This week we return to the Sudan Defense Force with a little attention to their trucks. There is virtually nothing written about the SDF in Libya, however they played a critical role in the Saharan campaign. They not only supplied Kufra with their great convoys, they also garrisoned the Kufra Oases, launched exhaustive search and rescue missions (the see the Tragedy at Kufra), assaulted Jalo Oasis during the ill-fated Operation Agreement, and chased after Lazlo Almasy's Operation Salaam (only narrowly missing the elusive Hungarian count). The site has some excellent photos of the Kufra convoys and expeditions, and it is these that I used as the basis of my SDF trucks. So I've dedicated some time to work on their trucks. They are not the flash raiding trucks like the LRDG or Autosahariana. 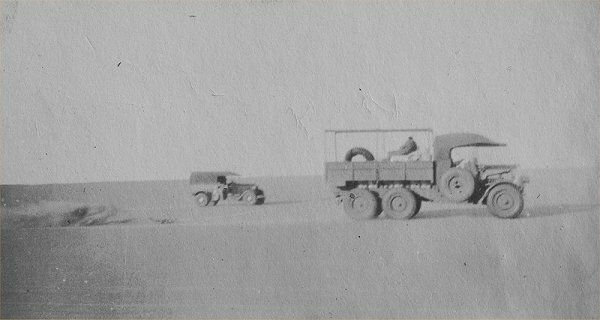 They were straight-up regular trucks purely for the benefit of hauling men and supplies across the huge expanses of the Sahara. However, they had an interesting array of trucks, which I have tried to replicate in my own SDF collection. 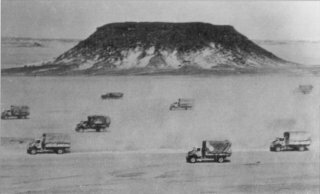 The convoys employed a number of these light trucks in their long hauls. However, they were relatively unreliable and couldn't carry many supplies. They were replaced by larger trucks as soon as they became available. These are a tough model to place in the BF range as there is nothing quite like it. 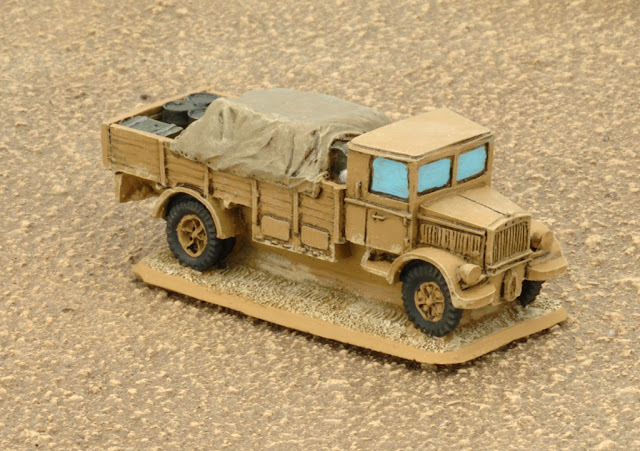 If pressed, I would recommend perhaps the LRDG Pilot car (BR444 LRDG Ford V8 Car) or perhaps even the a CMP 15cwt truck (On-piece Resin version: BR432 2x CMP 15 cwt trucks, or Kit Set version: BR431 2x CMP 15 cwt truck). The former is similar in shape, but lacks a cab, while the other is not at all the right shape, but the correct size. Of course, the German Opel Blitz looks very similar, however it is quite a bit larger (3-ton vs 1.5-ton). Personally, I'll be using my 8th Army's 15cwt trucks for this role. One of five of my 30cwt trucks. The Ford and Maple Leaf trucks were replaced by the more reliable and heavier Ford 30cwt trucks. These are perhaps a bit more familiar as the British 3-ton lorry. While this model is not exactly the same as the one used byt he SDF, its very close and fits the bill nicely. Like the other trucks in the BF range it comes in a kit-set variant (BR451 2x CMP 3-ton lorries) with the removable truck bed cover, or as a one-piece resin (BR452 2x CMP 3-ton lorries). I have used the one-piece resin models as they are both based (like the rest of my raiding trucks) and cheaper. Since they are merely transports, I didn't want to spend a lot of time and effort in the modelling aspect at this stage. Once again, Ford 3-tonners could very easily be represented by German Opel-blitz trucks, like my French Matfords. 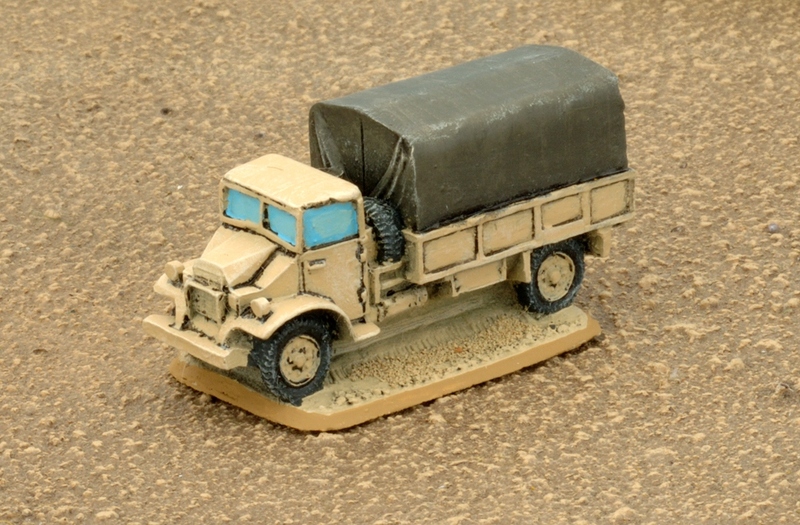 I plan to do up a couple of one-piece resin Opel-Blitz trucks (GE431 2x Opel Blitz 3-ton trucks) in generic khaki colors to cover a wide range of general Ford 3-tonners. SDF trucks. Anyone know their make, model, and year? If it helps, these are photos from the mid-1930s. I've painted up a couple of Italian trucks to use both for my Italians as well as some captured trucks for my Allied forces. I've painted a pair of Dovunque 35 3-ton trucks (IT431 2x Dovunque 35 3-ton trucks), mainly because they look very similar to the SDF vehicles in this photo to the right. The Dovunque was a complicated truck and not very popular in the Saharan Italian motor parks, so I only painted two of them. I've also painted up a pair of Lancia 3RO 6-ton trucks (IT440 2x Lancia 3RO 6-ton trucks). These were the workhorses of the Italian supply convoys in the Sahara and it was only natural that the French and British would put captured ones to use as well. They are roughly the shape of the White 10-ton trucks used by the SDF, if 4-tons lighter. Still, its a great looking and massive truck to add to the collection. I'll probably grab a few more. Lancias supplying an Italian fort. A Sudan Rifle Company, found on page 138 in Burning Empires, has access to a machine-gun platoon. I based that platoon on the machine-gun companies available to the SDF. 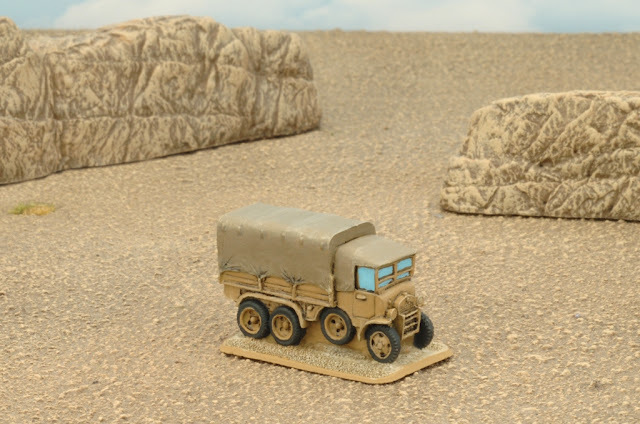 I have not discovered what trucks they might have possessed, so I decided to model mine to look like the ones they ran around with in the pre-war years during the Libyan Desert expeditions of 1933-34 (find more information here...). So focusing on Arkwright's photos, I've chosen to use the similar looking Soviet Zis-5 truck (SU422 2x Zis-5 3-ton trucks) for my machine-gun platoon. The photos clearly show that a variety of colors were used in the companies, so I painted a few Khaki and the remainder Dark Sand. They also sported aerial recognition symbols on some SDF trucks, so once I figure out exactly what those looked like I'll add in a few of those (they weren't RAF roundels as some would have you believe). Well, that's about it for this week! Next week I'll have a small article on the SDF Rifle Platoon I have completed for my Sudan Rifle Company. Very nice. Keep up the good work! What colors did you use to paint the canvas tops on the the trucks? I recently used Khaki on mine but I'm thinking the Khaki is a bit too green for the desert. Thanks! I did use khaki actually. Highlighted with German Camo Beige and drybrushed with Buff and pale sand for dust effects. Thanks for the info. I'm beginning to wonder if my Khaki is an older version or I modified it at some point. Perhaps it's time for a new one. Are you familiar with 'Moore's March' (Ronald Joesph March) through the Libyan Desert after the Battle of Kufra? There was a show called 'Narrow Escapes of WWII' about it on TV recently and with some great LRDG footage and information. Yes, that is an amazing story! 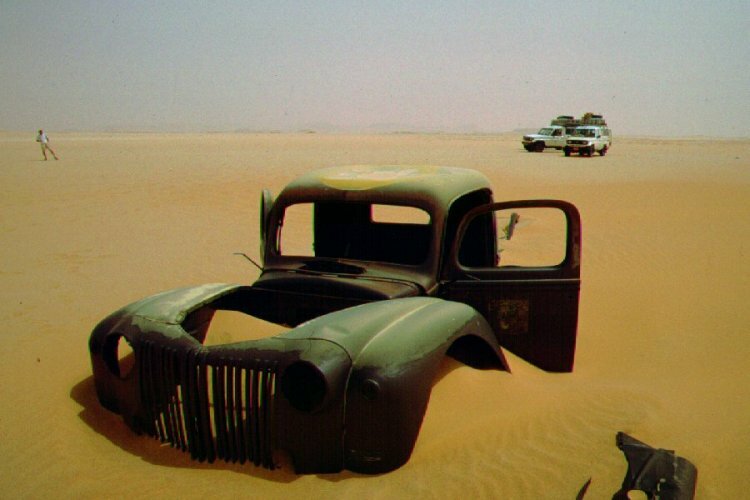 Its staggering just how many such escapes occurred in the desert. There were a few troopers that walked from Tobruk to Allied lines in 1942 after Operation Agreement fell apart and they were left behind. Great stories!